The Danish brand with an eye and ear for detail and sound, SACKit, have a new €95 speaker release. This time a portable, ‘sort-of’ pocketable speaker that they believe is so good you’ll want not just one but two of them, for an immersive stereo experience. So we’ve been listening in mono and stereo to the SACKit WOOFit Go to reveal all we can about it. It’s no doubt a fashionable accessory, with a design that flourishes by garnering a harmonious image, free of any cutting right angles. Also, like the previously reviewed SACKit MOVEit speaker, alternative coloured fabric fronts are available to purchase separately, so these can be interchanged if you wish. It’s a beautifully soft Xpress domed fabric, that is actually our favourite facet of its Scandinavian charm. But we always make sure portable speakers stand up to real world use, so after leaving the SACKit WOOFit Go on damp autumnal leaves outdoors, clumsily accumulating some painted fingerprints on it, and hanging it from door knobs and branches thanks to its chorded carry loop, we can reveal that its materials, though deceptively delicate in appearance, are tough and durable, as marks will happily wipe away; including paint dried on its fabric front. Furthermore, a deceivingly aluminium-like hard plastic shell, seen externally as the band around the entire speaker, is the core that establishes a solid speaker design that has already survived being dropped. A rubberised back prevents the resting side of the body from becoming damaged and also resists bouncing when playing music on all the surfaces we’ve had it upon. In fact, looking across all the ultra-compact wireless speakers we’ve reviewed, this is the best built in its class by quite some way. Bluetooth is straightforward. All our devices find the Go on the first encounter and in all subsequent use. Range is very good too, with 20 metres of true indoor range before the audio stream becomes jarred. Battery life is another positive; the stated 8 hours has been delivered during our usage. We’ve not been going easy with volume levels either, having it outputting at over three quarter level nearly constantly. Plus the Go has the function of turning itself off if not used for around 15 minutes, thus preserving battery life. The real emphasis of control is through the device broadcasting audio through the Go speaker. However, that’s not to say no functionality exists on the speaker itself, as you can still do quite a lot with the speaker's one button. Obviously it’s the power button and also has the pause/play function. Volume, however, cannot be controlled here; but that’s not too much of a problem, because at least when the broadcasting device does all the heavy work, you can be sure the volume level is exactly what it states and is not masked by another sub-volume control on the speaker. This has been a year of surprisingly good portable speakers in terms of sound to size ratio, but the SACKit WOOFit Go earns the trophy for being the greatest exponent of this equation. Singularly it outputs volume that is plentiful enough to fill kitchens, living rooms, home offices, etc, with full sound. It's a mammoth leap from inbuilt speakers in tablets, smartphones and notebooks. With the hanging attribute heavily encouraged for the Go, we were worried that when not lying on a solid surface, the bass would drown out and the general clout of the sound would be lessened when in mid-air. To our ears' surprise this isn't the case, instead it makes the likes of the similar sized X-mini KAI2 speaker seem trivial in terms of impact and quality. Bass resonates and doesn't reverberate. A track like ‘Get Out of My Life’ by Joe Williams, has deep vocals and musically pungent musical arrangements that the WOOFit Go speaker replays with impressive accuracy, and the mid-range is roomy too. Of a huge surprise is the fact that instruments and vocals aren't laminated on one level, but instead there's a noticeable amount of space between individual elements. ‘Woman’ by Harry Styles reflects the higher range performance attributes, with the piano and vocals illustrating a pretty good general performance here too. It’s a capably flexible speaker creation that serves to offer both volume and enjoyable detailed listening qualities normally found in speakers 4 times its size. Our only criticism is when in mono, with one SACKit WOOFit Go, the sound output can at times appear crammed when listening to livelier performances. However, this relatively rare qualm disappears when we introduce a second Go speaker into the equation. The entire sound experience then becomes heightened through both the true stereo and the greater substance of warmer sound being served. The second speaker is a neat party trick that will always benefit, but here's the caveat: unless using them indoors stereo is less desirable. Generally portable speakers are placed closer when outdoors and the ultra-portability is lessened if using two, so we don't find ourselves using the stereo through a second speaker much out of the studio. Although, in total contrast, indoors we nearly exclusively use two in stereo mode. We love the honesty of the Scandinavian design: it’s what enables the SACKit WOOFit Go to be so utterly usable, grab-able and not to forget, hangable. It makes the slightly dinkier infamous X-mini offerings look and sound out of date. 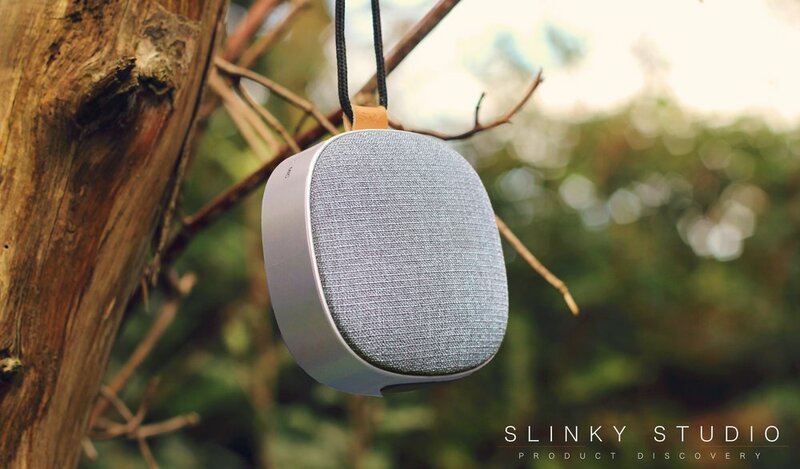 It has a real-world 8hr battery life, room cramming sound projection and has the best looks and build of any compact portable speaker currently available.